Home » Face » Are you flushed or do you have Rosacea? Are you flushed or do you have Rosacea? Have you found yourself having any one of these symptoms? The most common of all are the first two. I’ve known people whose faces look perpetually flushed, whether it is hot or cold. In our hot and humid weather the redness is even more accentuated. In fact, my brother seems to have some of the symptoms but not to a very severe degree. If you have these symptoms, you might have Rosacea. Rosacea is a skin condition that doesn’t seem to be widely talked about here in Malaysia. I find it rather odd, as the number one trigger for rosacea is actually sun exposure, followed by stress and hot weather. Our country, being hot and humid, has 2 of the top three triggers of this disorder, yet I don’t hear much about it. Is it because it is not very common here, despite the sun and hot weather? Or is it that its as yet an undiagnosed condition for many who suffer in silence? How I came to know about it is through a beauty forum I used to frequent. Some of the women there spoke of having rosacea, which prompted me to read up on it. Rosacea.org has a lot of useful information on this and how it may be treated and the FAQ is very informative too. It would appear that rosacea is more common in people with fair skin, or maybe it just shows up more and is more obvious. Its harder to detect a flush on someone with darker skin and pimples might just be passed off as that, or as a rash. Also, as I said, I don’t notice a lot of this skin condition here in hot humid Malaysia. I also picked up that spicy food and a hot environment were triggers for this condition. Malaysia is swimming in hot humid weather and spicy food! So, I’m wondering if it might be genetic instead? 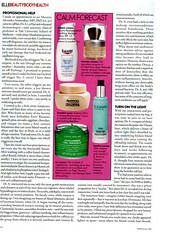 Elle has a good article in their July issue about Rosacea. 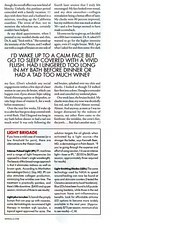 I’ve attached pictures of the articles but you’ll have to click to enlarge and hopefully be able to read it. Apparently, there is no cure for Rosacea, but there are ways to help keep it under control. One of it is skincare that has anti-redness functions like that of Eucerin. I’ve noticed an anti-redness line in Eucerin and used to wonder what it was for. Now I know. There are also many other products and treatment that can help keep it under control, like laser treatment to help with the removal of blood vessels. So the next time you think you are flushed, watch the flush. If it doesn’t go away after a while, or if it comes back again and again, leaving your face red a lot of the time, you might have rosacea. To be sure, see a dermatologist. There are antibiotics and various treatments to help keep it under control so it doesn’t take over your life. And since sun exposure is a number one trigger, there is no better time to advocate the use of daily sunscreen, and to limit your sun exposure. Your skin will thank you for it. NEXT POST: Are you wanting a Chanel Turbulent Blush? hi. yeah. i have rosacea. I’ve been trying to treat it. Took some pills. But it has yet to work. I cant find any products for rosacea here in malaysia. its getting frustrating. I guess i understand, Malaysian has hot weather but Malaysians have skin that can handle it. So perhaps thats why it isn’t talked much here.